Do you think I’d be able to attract people to Filth Casserole, the format I like that nobody plays, with the fact that Lightning Helix is still legal in it? It’s pretty far above the curve judging by the current Standard, if we assume Lightning Strike is the baseline: you get three life for the low, low cost of having to spend white mana on it. It actually opens up more options than it closes – the idea of white’s efficient cheap creatures backed up by this spell was, is, and will be scary. You could say the same thing about a control deck using this as an efficient removal spell that also cancels out the damage from one or even two attacks. Despite its inherent power and my much-publicized liking for “fair” cards, I think this should actually come back to Standard one day too. I’m told it was actually close to making the cut for Return to Ravnica, but they were concerned about its interaction with Snapcaster Mage. Thanks for that, Tiago Chan. But until it does return, we’ll always have Filth Casserole! Staple together a Lightning Bolt and a Healing Salve, and you approximate Lightning Helix. More or less! 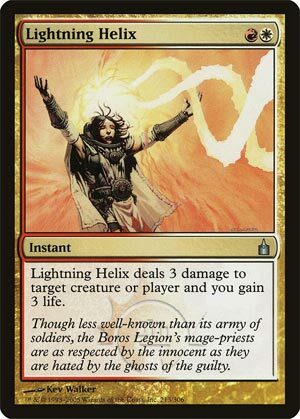 The strength of the Helix, though, is that it does a lot of subtly powerful things for only two mana. It’s creature removal, it’s a six-point life swing to your opponent’s face, it dings planeswalkers…and all for one card, an easy target to bring back with any manner of red or blue recursion effect. Again, while each individual half of the card is doable for one mana, you’re saving cards to put this effect in your deck. And, as a unique burn spell, there’s nothing stopping you from running a playset alongside other staples like Lightning Bolt and Lava Spike. While it might not be the most powerful burn spell ever printed, the strength of its efficiency has made it a Modern staple in burn decks and any deck with both red and white.